The 5th day of the waxing Moon phase (Shukla Paksha) in the month of Sawan or Shravan (mid-July to mid–August) is celebrated as Naga Panchami. ‘Naga’ means ‘Cobra’ or ‘Serpent.’ ‘Panchami’ means fifth lunar day. It is an auspicious day for devotees to worship snakes or serpents and Naga Devatas (snake Gods) for receiving serpentine blessings in life. This day is also known as Garuda Panchami. Naga Chaturthi is followed by Naga Panchami, the next day of Chaturthi. Naga Panchami is an ancient observance which dates back even before the Vedic culture came into existence. Naga Panchami or Garuda Panchami is a very important festival, which is celebrated throughout India, more prominently in southern parts of India. Women undertake fasting and wholeheartedly pray for the wellbeing of their siblings. This ritual can help to reduce the intensity of the affliction or congested energies from the snakes and the snake planets Rahu and Ketu. Snakes have assumed different forms in Indian mythology and act as the symbols of many deities. Lord Vishnu has Ananta Sesha (foremost serpent god) as his bed, and that is what is called as Lord Vishnu in Ananta Sayanam (the reclining posture of Lord Vishnu on the serpent). Lord Shiva has adorned the serpent around his neck. 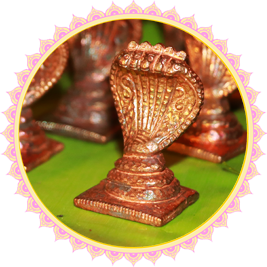 Lord Muruga is also worshipped in the form of a snake. In the Treta Yuga (second epoch), Lord Rama’s (7th incarnation of Lord Vishnu) younger brother Lakshmana was none other than Adisesha. In the Dwapara Yuga (third epoch), Adisesha took the form of Lord Balarama, Lord Krishna’s (8th incarnation of Lord Vishnu), elder brother. There are different mythologies behind Naga Panchami. According to Mahabharata, a large venomous snake named Kaliya was residing inside the River Yamuna. It was tormenting the villagers along the Riverbanks. Since the snake was too big and powerful, villagers were too afraid to venture, swim or raft across it. One day, when the young Lord Krishna and his friends were playing with a ball near the river, the ball fell inside the river, and Krishna jumped to retrieve it. While he dived inside, he was attacked by Kaliya. In a fitting reply, Krishna caught the snake and began to fight. Kaliya soon realized the immense power of Krishna and recognized him as an avatar of Lord Vishnu. It bowed down to him, promising not to harass the villagers in the future. The victory of Lord Krishna over the massive snake is celebrated as Naga Panchami. There is another story behind the adherence of this Naga Panchami, which depicts the love and bonding between brothers and sisters. Once in a village, there were 7 brothers who had a younger sister. They had lost their parents at a very young age. Hence, these 7 brothers took good care of their sister. For their livelihood, the brothers use to work in the farmlands and cut trees in the forest areas. The sister used to cook food for her brothers every day and go to the farm to feed them. One day, not knowing that it was Naga Panchami, as usual, she cooked food and took it to her brothers. As it was Garuda Panchami, there was a fight between Garuda and a serpent in the space. Garuda had caught the snake in his beaks, and the serpent was emitting poison. This poison fell in the cooked food cooked by the sister without her knowledge. When she went and fed her brothers, all of them died due to consumption of poisoned food. She screamed not knowing what had happened and she attempted to eat the same food and die. Lord Shiva and Goddess Parvati, took the form of an old couple, descended to the earth and went to her. They stopped her from dying and explained what had happened. They helped her to observe the Naga Panchami rituals. After the Poojas, they asked her to take some sacred mud from the bottom of the snake pit and the Akshada (raw rice mixed with turmeric) and keep it in the tip of the right ear. She followed the instructions, and to her surprise, all her brothers got back their lives. When the brothers asked what had happened and how did they go to sleep, the sister explained the whole situation and the importance of the day. Naga deities and Naga Devatas (snake Gods) are worshiped throughout the country. On this day, people go to the place where there are snake pits, offer cow’s milk and pray to the serpents there. Some people go to the temples where the snake idols are installed. They do Abishekam (hydration Pooja) with water and, milk, apply turmeric powder and dots of kumkum (red vermillion powder). Then, they offer prasad, light incense and show aarti (light offering). Finally, they tie a sacred yellow thread on their hands, with 7 knots in it representing the 7 brothers. Some perform this ritual at their house to an idol of snake made of the silver. They perform Abishekam (hydration Pooja) to the idol and follow all the usual procedures. Special Prasad will be made and offered to the deity. It is believed that offering food to a Brahmin on this day is very auspicious. On the day of Naga Chaturthi / Panchami digging of soil, plowing of the field and cutting of trees need to be avoided. Rahu is a Nodal planet. It does not own any sign in the natural zodiac. Ketu is a Nodal planet. It does not own any sign in the natural zodiac.